Again, just because - our new play park has been completed, it's great for all ages and on this occasion we went after dinner for a quick play before bedtime, it was full of teens having a great time, climbing, gas bagging and having a kick-about - and they were all so considerate of my two much smaller boys. 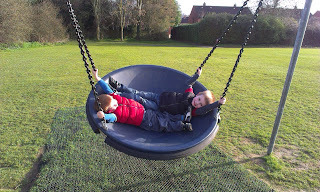 The boys wanted to use the bucket swing above, it was already being enjoyed by 6 girls and when the boys asked very nicely if they could have a turn in a bit each one hopped off straightaway and even said how nice it was to be asked so politely! Glad to see we don't have to believe the press, they're clearly not all bad - far from it. Aww, I like to hear nice things about society and "the youth of today" as the press spends so much of the time badmouthing anyone under the age of 18.